The world knows these words from the U.S. Declaration of Independence well. It’s a foundation of our country’s vision of a land where everyone has an equal opportunity to enjoy life, liberty and the pursuit of happiness. In the years since those words were written, America’s leaders have amended our laws to make it clear that every citizen is entitled to the same rights, regardless of their gender, skin color or other characteristics. That work isn’t finished yet, though, because the LGBT community still faces discrimination in the workplace and in their personal lives. Legislation like the “religious freedom” bill recently passed in Indiana is a giant step backward in the march for equality. 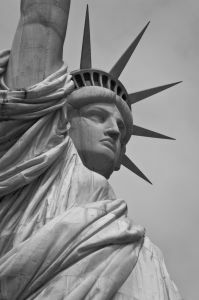 Other “religious freedom” legislation already exists in some states, and is pending in others. Although I fully support laws that protect an individual’s right to practice his or her faith (or not to practice any faith) without government interference, I do not believe in laws that allow discrimination against anyone, for any reason. So it does my heart good to see an outpouring of support for LGBT equality in the wake of the Indiana bill being signed into law. Across the country, people are standing up and being heard. We are a non-partisan, nonjudgmental group looking to provide a grassroots network for people to support businesses that open their doors for everyone – Black, White, Gay, Straight, Christian, Atheist, Disabled . . . well, you get our drift. 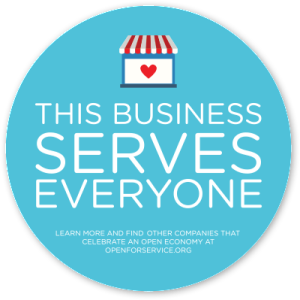 Open for Service’s mission is simple: to celebrate businesses that oppose discrimination of every type. For a $10 contribution, businesses can be added to the Open for Service roster and receive a window sticker to show their customers that they believe everyone is equal — and will serve everyone accordingly. As a small-business owner, I’m proud to sign on to Open for Service. I may not have a shop window to display my sticker in, but I gladly join businesses across the country in saying I would never turn away a customer because of who they are, what they believe, or who they love. Open for Service also sends a positive message of unity and lets those who may fear discrimination know they are welcome. I believe in equality, and I believe in the collective power of people to drive positive change. Together, we can make sure America remains a country that upholds the principle that all men and women are, indeed, created equal — and makes sure everyone is treated that way. I’ve always believed in the power of storytelling. It started in my childhood, with fairy tales and fables, and quickly moved on to stories that were based in truth, like Little Women and the Little House on the Prairie series. 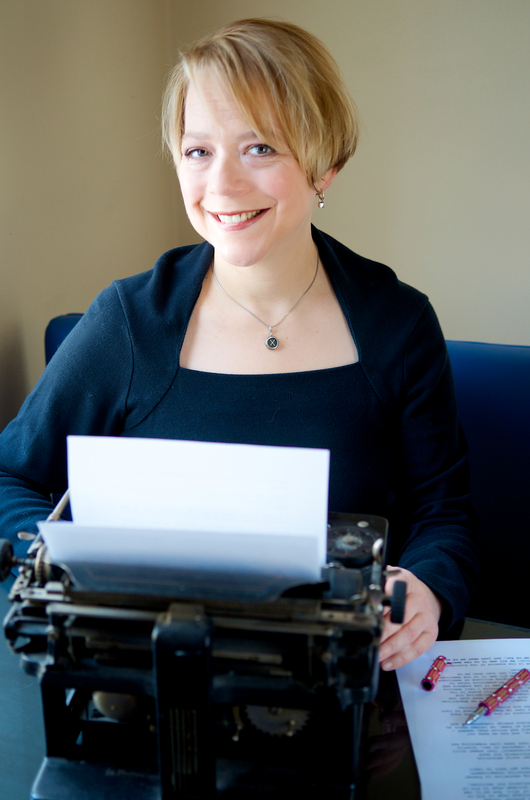 Even back then, I was most interested in stories that taught me something about real life, so it’s no surprise that I use storytelling to educate and engage in my work today as a healthcare and issue advocacy communicator. Storytelling’s strength lies in its ability to draw you in, to capture your attention and hold it, to make you yearn to find out what happens next and see how it all turns out. Personal stories can bring humanity to even the most complex concepts, making them approachable and putting them in context that helps us learn and remember facts. I was delighted to see these principles reinforced at the 2015 frank gathering, which brings together people like me who work in the field of public interest communications — people who “speak for the greater good,” as frank puts it. Many of the presenters talked about the power of storytelling. Chip Giller of Grist reminded us that we all have stories — it’s a common thread of our humanity — and that stories strengthen our memories. Mark Little of Storyful told us he believes we’re in the midst of a storytelling revolution because social media lets us tell each other our stories directly. Of particular interest to me was Brendan Nyhan, a political science professor from Dartmouth College, who spoke about why myth-busting usually doesn’t work — and why people cling to incorrect assumptions even more tightly when presented with facts. I’m a big believer in fact-sharing, but it can backfire because facts often challenge people’s deeply held beliefs. “Throwing facts and science at people isn’t the answer,” Nyhan said. So what is? In part, he told us that values and identity matter when you’re trying to dispel misconceptions. The way I see it, nothing gets at the heart of human values and personal identity better than stories. And I think storytelling is the best possible way to gently communicate facts. I call it “take-your-medicine” storytelling — the story is the sugar that helps the medicine go down. And it works. I’ve been using it successfully for years to motivate people to improve their health and their lives. Everything I experienced at frank will help me build on my skills and find new ways to use storytelling to educate and engage. In fact, some of it found its way into the presentation I’m giving at the 2015 Plain Talk health literacy conference. In my session at Plain Talk on using storytelling to boost health literacy, I’ll be educating attendees on the principles of good storytelling. I’ll use examples like The West Wing, which is stellar take-your-medicine storytelling because it teaches people facts while entertaining them with stories of characters they care about. Especially in healthcare, storytelling provides invaluable context that makes it easier to learn and remember information. It provides a framework for communicating even the most uncomfortable topics. It turns what might otherwise have been a pile of cold, clinical facts into a personal story of the human experience, which is something every one of us can relate to. 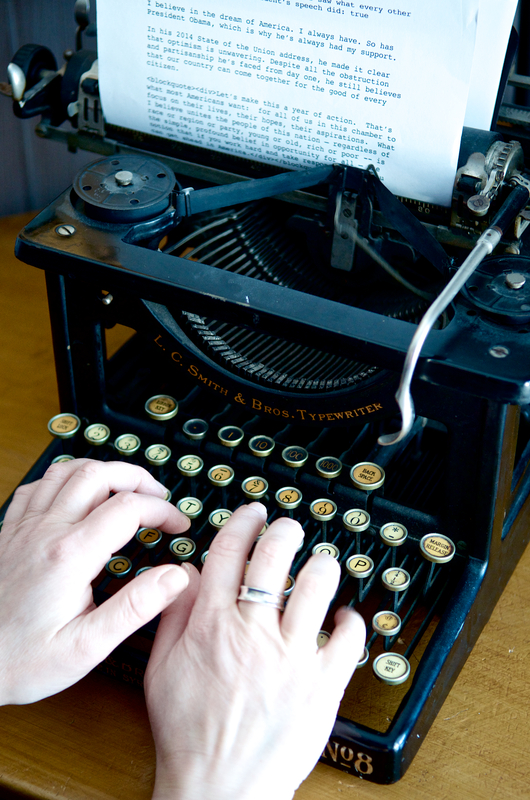 Storytelling is one of the best ways there is to communicate complex topics with clarity. We all know what storytelling is. It’s part of our everyday lives. But storytelling is something many people don’t feel confident doing themselves. I’m excited to have the opportunity to help others shape and refine their own storytelling skills — the seeds of which were probably planted in childhood. With the right guidance, everyone can use the power of storytelling to make their communications more meaningful and memorable. Photos by LAF Lines Photography.